31.3.1889: Inauguration of the tower. 15.5.1889: Opening of the World Fair. The lifts of the tower were not yet ready. Between the 15th and the 21st of May, 29,922 persons climbed the 1,792 steps to the summit. 1.8.1889: Nasser-ed Din Shâh, the first Iranian monarch (Persia at that time) to travel to Europe, visited the World Fair. At first he refused to climb the tower but ordered some of his attendants to take the lift. “It’s noisy” he said while watching the lift ascend. After waiting patiently for their return, he decided to climb the tower… by the staircase. 15.7.1898: The first suicide, a man hanged himself from one of the beams. In 90 years, there have been, according to the Police Préfecture or the media, 369 suicide attempts, of which two survived the 57 metre drop from the first floor, one being blown onto a rafter by the wind and the other landing on the roof of a car. The later was a young woman who after recovering, married the owner of the car. The Société de la Tour Eiffel has indicated that there have been only 349 successful suicides from the tower. 5.11.1898: Eugène Ducretet (1844-1915) made the first radio link between the tower and the Panthéon, 4 km away. 1900: The illumination of the tower was completely electrified. 1901: Alberto Santos-Dumont (1873-1932) tried to manoeuvre his airship around the tower. Unfortunately he crashed into the tower but came out of it in one piece. In the lift, a frightened woman gave birth to a child. 1906, he sent perfectly audible radio messages to sea-going ships from the top of the tower. During the Moroccan Campaign in 1907-08, a radio link was established with the city of Casablanca and with the cruiser Kleber. By 1908, Ferrié had succeeded in increasing the range of the transmitter of the Eiffel tower from 400 km to 6,000 km. Due to his work, French military wireless communications were the world’s best when the First World War broke out. 1909: First flight by an aeroplane above Paris and the Eiffel Tower. 23.5.1910: First regular broadcasting of time signals (as far away as 5,200 km at night, half this distance during the day). 1913: There were plans to demolish the tower: it was the First World War which saved the tower. It was then used by the army as a military radiotelegraphic centre. 1920: It was suggested that the metal of the tower could be used to rebuild factories in the war-stricken areas. 30.12.1921: The famous theatre actor Lucien Guitry (1860-1925) and his son Sacha (1885-1957) produced the first live radio program broadcast to be transmitted from the tower. 1922: Beginning of broadcasting of Radio Tour Eiffel. 2.6.1923: Following a bet, journalist Pierre Labric rode a bicycle down the 347 stairs from the first floor. 1925: First experimental television broadcasting by Edouard Belin (1876-1863, also the inventor of the “bélinographe” in 1907, for transmitting photos by radio). During the same year, Fernand Jacoppozi assembled a giant word “Citroën” made up of 250,000 bulbs, on the tower. The assembly of this advertising for the car factory cost 2,500,000 French francs; the service and electricity consumption amounted to one million French francs per year. Illuminated in 6 colours, the name was visible from 38 km away: the “N” was 20.8 metres high. The sign was dismantled in 1936. 1926: Léon Coliot attempted to fly his aeroplane between the feet of the tower. Blinded by the sun, he crashed. 26.4.1935: First television broadcast, with a picture resolution of 60 lines. In 1945, the resolution was increased to 441 lines. June 1940 until August 1944: Occupied by the German Army. From August 1944 to March 1946: Under the control of the American Army. 1.6.1946: Re-opened to the public. July 1954: Alfred Thomanel scales the tower. 1959: Installment of a new platform for the parabolic transmitters of the three TV channels and for an FM radio transmitter. The height of the tower reached 320.75 metres. 1960: An English tradesman proposed to sell the Eiffel tower at 20 centimes per kilogram, to several scrap merchants. An interested Dutch company paid a significant deposit to the tradesman. When the fraud was discovered, the Englishman was sentenced to prison but the Dutch company never recovered its deposit. 1964: The tower was classified an “historic monument”. 1980: Roped mountain climbers scaled the tower, broadcast live on the Eurovision program. From 1980 to 1983: Program of renovation and modernisation. The electrical network was changed. The 160 metre spiral staircase (996 steps) and the lift between the second and the third levels were dismantled, 4 new lifts were installed with a maximum capacity of 1,700 persons per hour (previously 600 persons per hour). A new reception structure was built on the first floor and the three original pavilions rebuilt. A panoramic restaurant, “Le Jules Verne”, was built on the second floor. The flooring of the first floor was lightened. At this time the tower lost 1,343 tonnes and its weight decreased from 10,100 tonnes to 8,757 tonnes. 1.2.1983: The pieces of the former spiral staircase were sold at auction (prices varied from 50,000 to 180,000 French francs a piece). 31.12.1985: A new system of lighting was installed: 292 spotlights now illuminate the tower. “We, the writers, painters, sculptors, architects and lovers of the beauty of Paris, do protest with all our vigour and all our indignation, in the name of French taste and endangered French art and history, against the useless and monstrous Eiffel Tower…. ” This is the first sentence of a letter of protest written by such famous French people as Alexandre Dumas Jr, Charles Gounod, Joris-Karl Huysmans, Charles-Marie Leconte de Lisle, Guy de Maupassant, Sully Prudhomme, Paul Verlaine, … to Mr Alphand, one of the directors of the 1889 World Fair after the engineer Gustave Eiffel had launched the construction of the tower on the Champ de Mars in the west of Paris on January 28, 1887. This was only one of the difficulties with which Mr Eiffel had to cope. At the time a distinguished mathematician told the press that the tower would collapse when a height of 221 metres was reached. 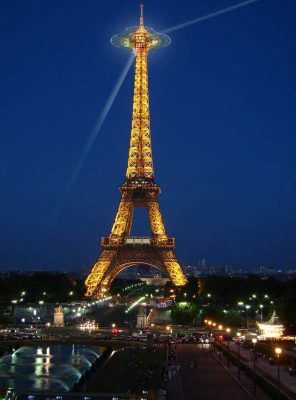 This incited some of the residents of the Champ de Mars to lodge a complaint against the State and the City of Paris about the dangers of the tower falling on their houses. Building such a high tower for that period was not Gustave Eiffel’s idea. One day in 1882, Maurice Koechlin, chief of the Research Unit of the Eiffel Company, and his colleague Emile Nouguier conceived the idea of a metal tower for the 1889 World Fair which was to be held in Paris. The first draft by Koechlin was dated June 6, 1884. Koechlin (1856-1946) and Nouguier submitted the draft to Gustave Eiffel who said he did not want to be involved, but let his two engineers continue developing plans for such a tower. With the help of the architect Sauvestre and the sculptor Bartholdi, the two men submitted their project to the General Commissioner of the Decorative Arts Exhibition who agreed to display a drawing of the tower in Autumn 1884. At that time, Gustave Eiffel decided to join the project. In September 1884, he registered a patent for “a new design for building metal pylons to a height of more than 300m” and in December, signed an agreement with his two engineers. Nouguier and Koechlin gave up the exclusive ownership of the patent to Eiffel who, in return, took care of the expenses of the patent and undertook to pay to each engineer a bonus of 1% on all the amounts which would be paid to him for the construction of the tower if the project was accepted. He also committed himself to quote the names of both engineers each time the project or the patent was mentioned (this last promise was never kept). For years, some fifty engineers and draughtsmen prepared 5,300 drawings and plans for the 18,038 pieces of the tower: according to the calculations, 10,416 persons would be able to visit the three platforms at the one time. All the plans still exist: in case of a cataclysm, it would be very easy to rebuild. Its total weight was 9,700 tonnes of which 7,300 for the metal parts. On June 12, 1886 the project received equal first prize in a competition organised by Mr Lockroy, the then Minister for Industry and Trade: 17 other projects out of 700 were also rewarded. An agreement for the construction of the tower was signed on January 8, 1887. On January 26, 1887, the excavation began: 31,000 cubic metres of earth were removed and 12,500 cubic metres of masonry were cast. Each step in the construction brought new difficulties or problems. The first problem came from the clay of the Champ de Mars which could not withstand a pressure of 3 or 4 kg per square centimetre and secondly, workmen discovered that the piles for the northern and eastern feet of the tower had to be driven into an ancient arm of the river Seine. Eiffel, who had experience in building bridges in river beds such as the Maria Pia Bridge which he built on the Douro in Portugal, used metal caissons driven in by compressed air. The masonry 14 metres below ground level, used the hardest stone of the Parisian region: it goes right down to the bedrock under the river Seine. The earthworks were finished on June 30, 1887 and the day after, the assembly of the metal parts began. The tower was not fully fixed in the masonry but lodged in cast-iron tubes where it could be adjusted, because Gustave Eiffel wanted to avoid any error in calculation. One hundred metalworkers prepared the 18,038 pieces in the Eiffel workshops in Levallois and drilled up to 8,000,000 holes for the 2,500,000 rivets of which 1,056,846 were subsequently fixed by the 132 assemblers on the site. For the platforms, 620 iron sheets were fixed with 55,000 rivets. On March 26, 1888, the first floor level was finished, 57.63 metres above the Champ de Mars. The sixteen hydraulic jacks with a power of 800 tonnes each were then removed after the first platform was set exactly level. Eiffel then installed a canteen for his workers on the first floor, where the prices were half those asked by the surrounding “marchands de vin” (the cheap fast-food of the time). On June 12 the second floor level was reached 115.73 metres above ground. At the same time, the painting of the tower began. The second floor was finished on August 14, 1888. In February 1889, the third level was reached, 276.13 metres above ground-level: there was still the top section to complete. Eiffel committed himself to finish the tower before the inauguration of the World Fair on May 6, 1889, one day after the centenary of the opening of the Etats Généraux in 1789. Many were hoping that Eiffel could not keep his promise but the construction was finished on March 30, two years and two months after it began. At that time the height of the tower reached 312.27 metres. The day after, Eiffel organised what he called the “fête intime du chantier” : members of the City Council of Paris, the General Council of the Seine Department and the Parliament were invited to climb the 1,792 steps with Gustave Eiffel! – the lifts were inaugurated two months later. Only twenty or so reached the summit and attended the hoisting by Eiffel of a giant French flag bearing the letters “R.F” . The then Prime Minister, Charles Floquet, 62 years old, stopped at the first platform and asked the Minister for Industry and Trade to continue the climb to present Eiffel with the Légion d’Honneur at the top of the tower. Remarkably there were no accidents during the construction of the tower. Some time later the Société de la Tour Eiffel, half of the shares of which belonged to Gustave Eiffel, signed an agreement with the Prefect Poubelle* for the commercial operation of the tower for the next twenty years to 1910, when it should be returned to the City of Paris. The problem of taking the visitors up the tower was one of the most difficult met by Gustave Eiffel. Lifts were still new technology of that time and the pylons were inclined at 54° from the ground to the first floor, and inclined at 80° between the first and second floors. Firstly, two Roux-Combaluzier hydraulic lifts were installed in the Eastern and Western feet. They were fast for the time, reaching the first floor in only one minute. In 1900, they were replaced by larger lifts built by the French company Fives-Lille with a capacity of 86 persons and 8 trips up and back per hour. They still exist. The power station was built under the southern foot. This is a very interesting part of the tower of which most of the visitors are unaware. In 1965, an electric lift was installed in the northern foot with a capacity of 106 persons and 12 trips up and back per hour. The total cost of the construction reached 8,000,000 gold francs (of which 900,000 was for the foundations, masonry and bases; 3,800,000 for the metal and assembly; 200,000 for the painting; 1,200,000 for the machinery and lifts; 400,000 for decoration, restaurants). The Société de la Tour Eiffel had a capital of 5,100,000 gold francs but there was no issue of public bonds. A private loan was fully reimbursed with the receipts of the first year of operation!The tower was opened to the public on May 15, 1889 and by the closure of the World Fair on the 5th of November 1889, 1,968,287 persons had visited it. By the 31st of December, the receipts reached 5,919,884 gold francs, that is around 3/4 of the total cost of the construction! At that stage the tower was illuminated with 22,000 gas burners. Gustave Eiffel was born in Dijon in 1832. He was a brilliant student at Ecole Centrale des Arts et Manufactures. In 1858, he built the railway bridge at Bordeaux where compressed air was first industrially used to drive in piles. He then built the bridge on the river Nive at Bayonne and the bridges of Capdenac and Florac. In 1867, he created his own company and workshops. In 1868, he built two large viaducts with metal feet (Viaducs de la Sioule et de Neuvial) and Maria Pia Bridge on the Douro river in Portugal. He became famous with the construction of the “viaduc de Garabit” to allow the railway from Béziers to Clermont-Ferrand cross the Truyère Gorge. This viaduct is 122 metres high, 564 metres long and its central arch a span of 165 metres: a true feat at the time. Studies for a 300 metre high tower led him to learn more about aerodynamics. In 1912, he created the first French research centre on aerodynamics and, during the First World War, he improved aircraft wings, propellers and missiles. In 1921, he donated his research centre to the French State. He died in Paris in 1923.